Two Russian bombers landed in Caracas, Venezuela Monday amidst an economic crisis there that has left 3 million refugees in its wake and caused shortages of food and medical supplies. The Russian Ministry of Defense said the Tu-160 bombers and two support aircraft landed at the Simon Bolivar International Airport on Monday. 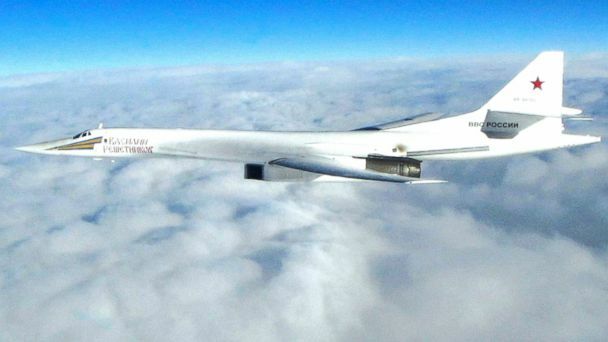 During the 6,200-mile flight, the ministry said the bombers were briefly escorted by Norwegian F-16s, presumably flying a NATO air police mission. This is the third time Russia has sent bombers to Venezuela. The other flights in 2008 and 2013 were for joint exercises with the Venezuelan military. The Russian Ministry of Defense did not say why the bombers were sent or how long they would stay in the country. The flight follows Venezuelan President Nicolas Maduro's visit to Moscow last week in which he announced $6 billion in Russian oil and gold mining investments. Maduro, in an ongoing feud with the U.S., has refused all American aid. The U.S. has provided nearly $97 million for Venezuelan refugees since October of 2016, according to the State Department. The money from the State Department is directed to countries accepting the refugees. The U.S. Agency for International Development Administrator Mark Green has said the U.S. stands ready to offer humanitarian assistance Venezuela if Maduro would allow access. In August, Defense Secretary James Mattis visited Colombia where President Ivan Duque requested assistance to relieve stress on his nation's healthcare system. Colombia has taken in the highest number of Venezuelan refugees at over 1 million, followed by more than 500,000 refugees in Peru and over 220,000 in Ecuador, according to the United Nations. The U.S. Navy hospital ship USNS Comfort was sent on an 11-week medical assistance mission to Central and South America. That mission concludes later this week. "Where we are providing humanitarian aid and assistance, Russia is sending strategic bombers, and so the U.S. approach to the region just differs from Russia's approach," Department of Defense spokesperson Col. Rob Manning told reporters at the Pentagon on Monday. "And the crisis can only be resolved by the restoration of a democratic government, rule of law, and respect for fundamental human rights and freedoms. I think the biggest thing here is the fact we stand with the Venezuelan citizens during their time of need, and that is what the symbol of the USNS Comfort represents." Late last month, Mattis made a similar point saying, "we are sending doctors, not bombers, to help limit human suffering." A U.S. official told ABC News that Mattis made the remarks based on U.S. intelligence reports that showed Russian bombers preparing for the flight that seemed imminent, but was then postponed until Monday. During its mission to Ecuador, Peru, Colombia and Honduras, the Comfort has seen over 20,000 patients at both land-based medical sites and on board the ship, depending on the patient's needs. The ship's physicians also conducted more than 600 surgeries. The Comfort's surgical and medical services include X-rays, CT scans, dental services, an optometry and lens laboratory, a physical therapy center and a pharmacy. The ship also maintains up to 5,000 units of blood for medical services.